At Premier Soccer Academy we are passionate about training youth athletes to prepare them for reaching their short and long term goals. We train players based on a principle that exercises need to be decision based and are fundamental to the development of a youth athlete. Premier incorporates this concept while orchestrating a professional environment that demands a use of technical skill, cognition ability and movement. We aim for a world standard benchmark that if met, will allow abudant success on & off the field. We haven taken the best curriculum & methods from various of environments and applied them to our Academy here in British Columbia, Canada. Premier believes in the player’s cognition development, where the Academy focuses on decision making exercises that have the technical & tactical blended in. Premier teaches 14 key principles separated into three major chapters: Managing Oneself, Managing Space and Managing the Ball. Lastly, Premier assess’s the player’s character and hones in on this critical part of their athletic journey. Without strong character we know that the athlete will not have a future athletic opportunity nor be ready for adulthood where his/her future occupation will demand specific personality traits. 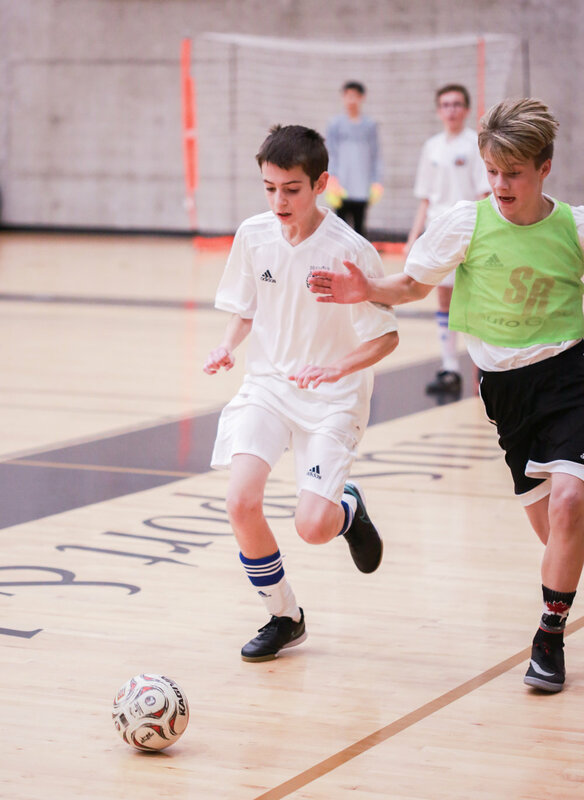 Futsal quickly develop skills required for soccer: balance, motor ability, agility, co-ordination, ball mastery, accurate and quick passing and receiving, perception insight and awareness. Children learn through repetition and practice in small areas this occurs naturally. 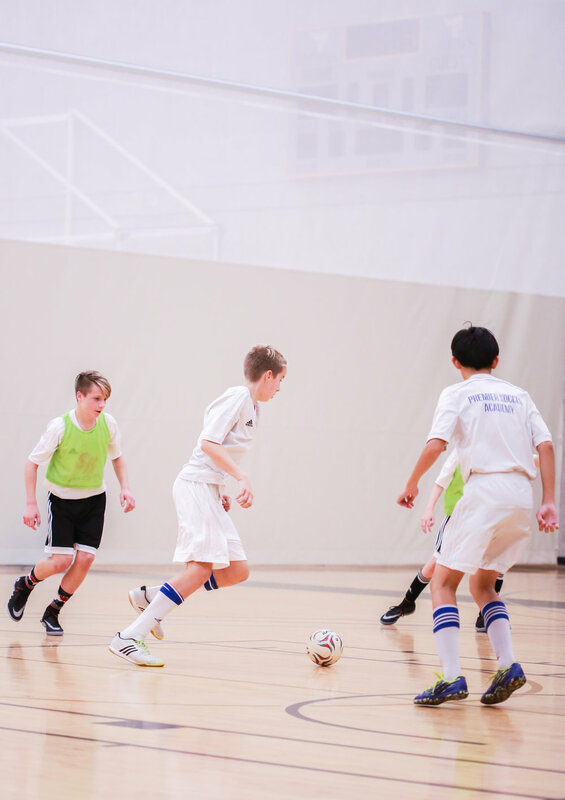 As Futsal is fast and action packed, fitness is improved while learning and having fun. 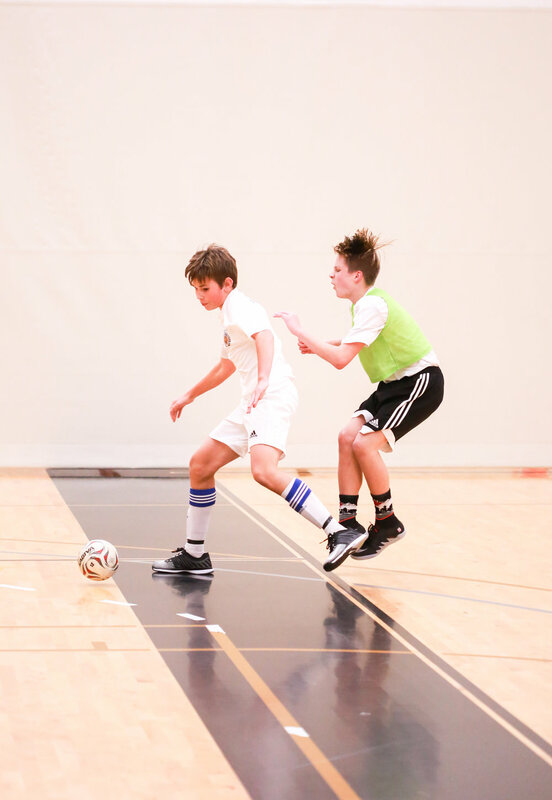 Futsal includes more playing time than field soccer, fast action and a bundle of frequent touches. Games are high scoring with numerous goals made by various players. Children learn so much faster if they enjoy the game and spend a lot of time playing with the ball. Futsal = Organized street soccer. Premiere Soccer Academy is committed to providing a sport and work environment which promotes equal opportunities and prohibits discriminatory practices and bullying. Harassment is a form of discrimination which is prohibited by human rights legislation in Canada. Bullying involves a person expressing their power through the humiliation of another person. Bullying may be a form of harassment but also has some of its own defining characteristics. The sport setting is one setting in which bullying occurs. In some cases coaches and players use bullying tactics deliberately to motivate performance and to weaken opponents. PSA supports the right of all its members, whether athletes, volunteers or employees, to participate in all PSA activities free from any form of harassment and bullying. Further, PSA emphasizes the importance of eliminating harassment and bullying in soccer as a key element in ensuring the safety of young participants. A sports environment which actively discourages harassment and bullying and builds relationships based on trust and mutual respect, is an environment which discourages the abuse of children and youth, and encourages the overall development of the individual. In order to further these objectives, PSA will make every reasonable effort to promote awareness of the problem of harassment and bullying among all its members, and to respond quickly and effectively to complaints or disclosures of harassment or bullying. It is the policy of Premiere Soccer Academy of Canada (“PSA”) that there shall be no abuse and neglect, whether physical, emotional or sexual of any participant in any of its programs. PSA expects every parent, volunteer and staff member to take all reasonable steps to safeguard the welfare of its participants and protect them from any form of maltreatment. It is the policy of Premiere Soccer Academy of Canada that harassment and bullying in all its forms will not be tolerated during the course of any activity or program. Accordingly, all “PSA” coaches and partners (parents/guardians) are responsible for making every reasonable effort to uphold this commitment. Specifically, this includes refraining from harassing or bullying behavior, responding promptly and informally to minor incidents of harassment or bullying and following local or national policy guidelines for reporting or responding to more serious complaints of harassment or bullying. Players and other participants are expected to refrain from harassing or bullying behavior and are encouraged to report incidents of harassment or bullying. Some behaviours which are defined as abuse, when a child or youth’s protection is at risk, can also constitute harassment or bullying, when the behavior breaches human rights or appropriate relationship/conduct boundaries. PSA Harassment/Bullying Policy covers such behaviours. Together, the two policies address the entire spectrum of abusive, bullying and harassing behaviours. Recognition and Prevention of Abuse Policy: This policy sets out the principles and practices of PSA with regards to abusive behaviour towards participants. Emotional abuse is a chronic attack on a child's self-esteem; it is psychologically destructive behaviour by a person in a position of power, authority or trust. It can take the form of name-calling, threatening, ridiculing, berating, intimidating, isolating, hazing or ignoring the child's needs. Neglect is chronic inattention to the basic necessities of life such as clothing, shelter, nutritious diets, education, good hygiene, supervision, medical and dental care, adequate rest, safe environment, moral guidance and discipline, exercise and fresh air. This may occur in soccer when injuries are not adequately treated or players are made to play with injuries, equipment is inadequate or unsafe, no-one intervenes when team members are persistently harassing another player, or road trips are not properly supervised. 1. Unwelcome jokes, innuendo or teasing about a person's body, looks, race, sexual orientation etc. It is important to note that the behaviours described in items 5 to 7, when directed towards a child or youth, constitute abuse under child protection legislation. This may also be true of other behaviours, for example, certain hazing practices. In such cases, the duty to report provisions of the Recognition and Prevention of Abuse Policy are applicable. Abuse and neglect are community problems requiring urgent attention. PSA is committed to help reduce and prevent the abuse and neglect of participants. PSA realizes that their trainers/coaches that are working closely with children and youth have a special awareness of abusive situations. Therefore, they have a particular reporting responsibility to ensure the safety of the parent/guardian’s young, by knowing their provincial protection acts and following through as required. Every province and territory in Canada, except the Yukon, has mandatory reporting laws regarding the abuse and neglect of children and youth; the Yukon requests that concerns be reported. Consequently, it is the policy of PSA that any PSA personnel, volunteer, and participant, or PSA (parent, guardian) who, has reasonable grounds to suspect that a participant is or may be suffering or may have suffered from emotional, physical abuse and neglect and/or sexual abuse shall immediately report the suspicion and the information on which it is based to the local child protection agency and/or the local police detachment. Across Canada a person is considered a child up to the age of 16 to 19 years depending on provincial legislation. Those involved with PSA in providing soccer development for participants understand and agree that abuse or neglect, as defined above, may be the subject of a criminal investigation and/or disciplinary procedures. Failure to report an offence and thereby, failure to provide safety for participants may render the adult who keeps silent legally liable for conviction under the provincial child protection acts. It is the position of PSA that harassment and bullying cannot and should not be tolerated in any environment, including soccer. Both harassment and bullying are unacceptable and harmful. PSA recognizes the serious negative impact of all types of harassment and bullying on personal dignity, individual and group development and performance, enjoyment of the game and in some cases, personal safety. At the same time, PSA recognizes that not all incidents of harassment and bullying are equally serious in their consequences. Both harassment and bullying cover a wide spectrum of behaviours, and the response to both must be equally broad in range, appropriate to the behaviour in question and capable of providing a constructive remedy. There must be no summary justice or hasty punishment. The process of investigation and settlement of any complaint of harassment or bullying must be fair to all parties, allowing adequate opportunity for the presentation of a response to the allegations. More serious incidents should be dealt with according. Complaints should be handled in a timely, sensitive, responsible and confidential manner. There should be no tolerance of reprisals taken against any party to a complaint. The names of parties and the circumstances of the complaint should be kept confidential except where disclosure is necessary for the purposes of investigation or taking disciplinary measures. Anyone making a complaint which is found to be clearly unfounded, false, malicious or frivolous may be subject to discipline.